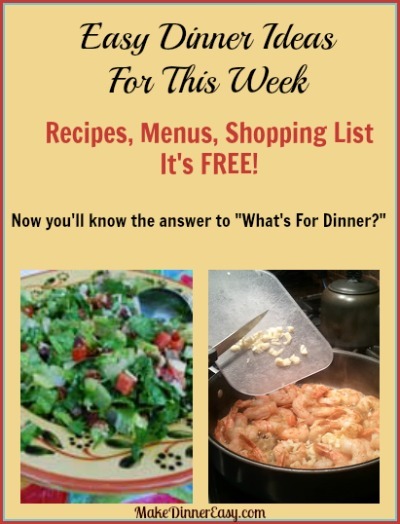 Each week, this page features a new set of free weekly dinner menus, along with easy dinner recipes, and a one page printable grocery shopping list that corresponds to the featured recipes of the week. 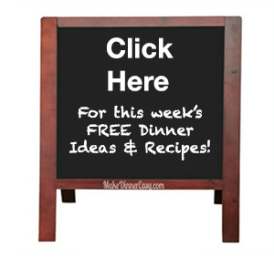 You can use these menus for inspiration for dinner tonight or for a week's worth of dinners! The dinner ideas that are listed here each week have hyper-linked recipes which you can click on to view the dishes that have been selected for this week. Below, you will also find a link for a detailed printable grocery list. This shopping list includes all of the ingredients needed to make the meals included in this week's menus. A check mark has been placed next to all the ingredients that you will need to have on hand or purchase to make the recipes for the week - You don't need to plan, I do all the planning for you! 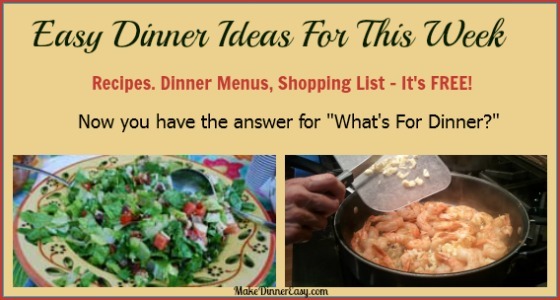 Clicking On The Printable Dinner Recipes and Grocery List below gives you all the information you need to make this week's meals. That Includes the Grocery List, Dinner Menus, and Recipes for This Week! Click for the printable grocery shopping list, dinner ideas and recipes for this week. with the grocery list to make printing easier - Everything in one click! I have some families who use the one step print link to print out the menus, recipes, and grocery list. They do the shopping, and leave the printout on the counter for whomever is home to start cooking dinner - Easy! I would still suggest you visit the individual recipe pages as listed above as I often include suggestions and hints in the Recipe Background section. You will need Adobe Reader installed on your computer in order to open and read this grocery list. You can get Adobe Reader here for free (a new window will open so you can download it without leaving this page). Most of these recipes call for common ingredients, so even if you are just looking for ideas for dinner tonight you might find an idea here! I do try to limit the processed ingredients and try to use a lot of fresh fruits and veggies so that that the menus are not only easy but healthy too. Make sure to bookmark this page or check back every week as I usually post new menus by Friday for use the next week. Most sites charge a monthly fee for this service. I'm doing this for free as I have so many people who write to me that it would be hard for them to pay for a dinner planning service on top of what they spend on groceries. I'm often asked if there is a fee charged to receive the menus, grocery shopping list, and weekly e-mail. I have made a conscious decision to keep this site free to all users in order to help others make homemade dinners with ease. If you would care to, I do accept donations instead of charging a subscription fee. You can click the donate button below and let me know how much this free service is worth to you. It actually means more to me when people donate after they receive the menu list for the week then if they paid a weekly subscription up front! Some of my visitors write and tell me that would never be able to afford a subscription fee or even to donate, but they pay me by spreading the word about this site. share a link on Facebook, or just pass the word on! That kind of payment is greatly appreciated as well! I'm now offering archived menus and printable grocery lists from the last month or so. As requested, last week's menu is listed on top for those of you who bought the groceries for last week and can't find the menus! In addition, I've had requests for a blank grocery shopping list if you want to create your own! Want to come back another day? Pin it for later! Need a quick and easy idea for dinner tonight? Here are some ideas! There are over 300 easy, family friendly recipes on this site. These are recipes that I make for my own family. They are dishes that I, as a busy Mom of 4, hav time to cook and that my kids will actually eat! These are not exotic recipes but could be characterized as healthy comfort foods without a lot of processed ingredients. Even if you don't think you have time to cook or haven't had much success with cooking in the past, I write my recipes in kind of a chatty manner that people tell me helps them achieve a great result. The feedback I get from many people is that they are making home-cooked meals, sometimes for the first time in their lives They also tell me they are saving money on groceries, ordering less take-out dinners, and that their families are eating dinner together. There are comments from many people who have used this site at the bottom of most pages. If you like what you see, I'd love to have you comment as well!